The creation of an online Liver Fluke Journal is helping shed light on the situation and give tips and ideas for farmers to discuss with their vet or health advisor to apply on their own farm. The journal is written by George Milne, a sheep farmer in Fife and NSA Scottish Regional Development Officer, and is very frank about the problems he has encountered in the past and the need to ask for help. The journal has been made possible because George’s farm is the first ever surveillance farm for the Scottish Fluke Action Group, which aims to provide insightful and educational information to farmers and prescribers to help combat the challenge liver fluke is posing to the industry. The Scottish Fluke Action Group was set up in the summer of 2013 as a response to the exceptional level of fluke in the winter of 2012/2013 and the impact the parasite was having on the livestock industry. The group includes key figures from the world of farming, science and industry and first met at the Moredun Research Institute near Edinburgh in August where the discussion centred around what could be done to both better manage liver fluke (Fasciola hepatica) and increase the awareness of it within the farming community. The working group includes Moredun Research Institute, National Sheep Association, Novartis Animal Health, Parkside Vet Group, Scottish Government, Scotland’s Rural College and the University of Edinburgh. 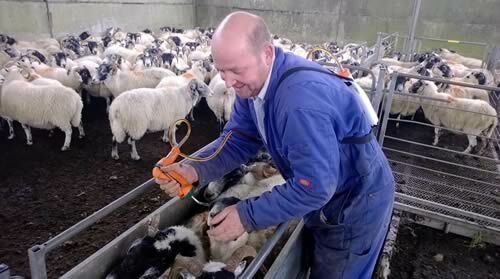 Novartis Animal Health and George’s own vets at Parkside Vet Group have been carrying out the surveillance work on the farm to help better understand the fluke situation this year.